Actually, I haven't really been all that lazy. I've just been lazy when it comes to blogging. I've been working a lot on the house, off with Pea celebrating our 4th wedding anniversary (already!!! it goes so fast), and yes, knitting. Almost anything and everything except sitting in front of the computer. I guess that's what summer is all about, huh? As for the knitting . . . . look, my "Shiny Happy Stripy Fun Socks" (with extra adjective added by Nancy) are done! Love 'em!!! It's far too hot to wear them, but I know they'll see a lot of action in the fall. They also have inspired me to try dying my own self-striping yarn. Well, no, that's not true. 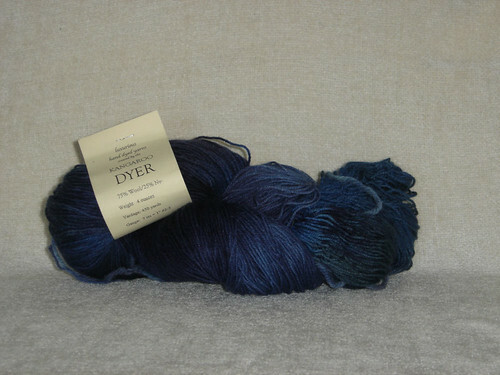 They've inspired me to THINK ABOUT trying to dye my own self-striping yarn. 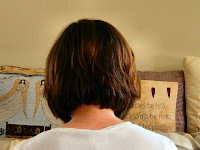 It is the Lazy Days of Summer after all . . . .
Jeanne over at Life in Cleveland made a very exciting announcement today. She's opened a new Etsy store with a very interesting spin. It combines her love of yarn and dying with her love of travel photography. Her first five colorways are being revealed one at a time, over the course of this week. Not only do you get to ooohhh and ahhhh over each new beauty - but you also get to see the beautiful pictures that inspired it and hear what each color represents. It's quite fun. 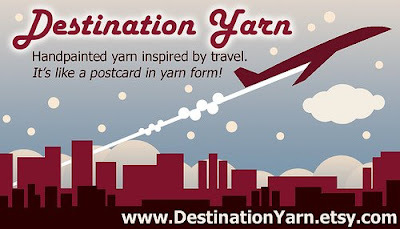 Even more fun is the chance to win your own skein of one of these yarn postcards. Get the details on this post, and please remember to tell her I sent you! I think it's about time we wrapped up the Harlot Day Yarn posts, don't you? After all, it's been two months since the big day! So last, but certainly not least, I present my final purchase from WEBS. 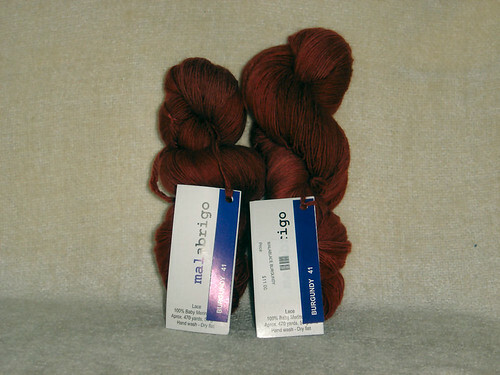 Two skeins of Malabrigo Laceweight in the Burgundy colorway. 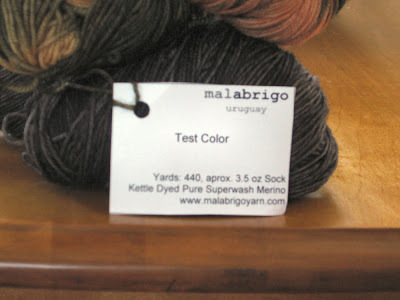 (Yes, there has been a lot of Malabrigo on this blog lately, hasn't there??) This was the only yarn I bought that day that wasn't on sale. But if you are going to pay full price for yarn, I'd say this is the yarn to choose. Worth every penny! I'm thinking it will become Icarus, but I may change my mind about 100 times before I cast on! Happy Stripey Fun . . . 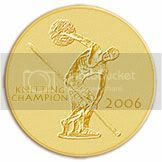 I realized that although I have been blogging lately, and there have been many posts that are fiber related, there hasn't been a lot of knitting shown on this blog lately. Let's try to solve that today, shall we? A quick look over at my side-bar will show you that I currently only have three projects on the needles. (Okay, there is a dishcloth too, but dishcloths don't count, right?) My main focus for the past couple of days have been my "Happy Stripey Fun Socks". Partially because they are so darn fun to knit!! Don't you feel happy just looking at them? Can you believe this yarn has been in my stash for two years? It was a wonderful part of my Dye-O-Rama swap package in June of 2006! It was dyed with Kool-Aid, if you can believe it. Jenny named the skein Happy Stripey Fun, and it sure is!!! It's a good thing these socks are addicting, because I'm trying to finish them up before Summer Of Socks starts, since socks-in-progress don't count for that KAL. I'm just about ready to turn the heel on the second sock, but I still doubt I'll have it done by tomorrow. That won't stop me from casting on my new Malabrigo at the stroke of midnight though!! What a weekend . . . . The melt-downs that were happening last week were quickly erased by the awesome weekend I had! Our dance performance on Friday went really well - although I was the only one who remembered all my steps. Unfortunately, when the instructor who was dancing with me forgot his steps, he held me back from the spin I was correctly trying to do. I'm sure on the video it will look like I forgot my step. Speaking of the video, when it comes I'll try to upload it here so you can see us in action. I'm hoping if I do that, you'll forgive me for leaving my camera in my bag all night when it was supposed to be taking pictures of us in our costumes. 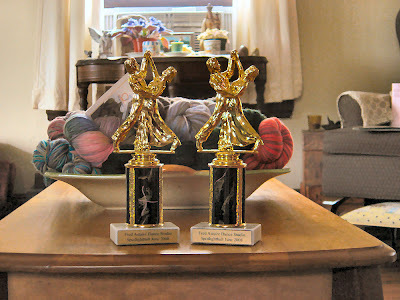 You can, however, see the tacky trophies we got for participating. Oooohhhhhh. Our costumes were 50's inspired, and I found the cutest little ponytail tie that looked like a scarf for my hair. Good thing the performance was on Friday night, because by mid-morning on Saturday my ponytail length hair was gone. 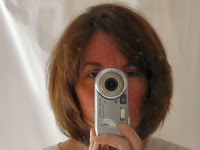 I ended up with quite a short cut, especially in the back, but I really love it. 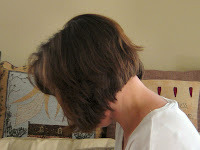 It's a layered bob that angles from really short in the back to a bit longer on the sides. Here is my hair before (from the WEBS pictures) and now. It was very hard to get good pictures of the front and sides. I resorted to the bathroom mirror shot to try and show the front. And don't ask me why that little piece of hair is sticking up in the back on my side shot - I hope it doesn't usually do that!! Sunday . . . well, Sunday was the best day of the whole weekend. It was our local Stitch N' Pitch event. Seventy knitters and friends / families of knitters hit the Bluefish stadium for some fiber and baseball fun. A brief downpour in the second inning caused a bit of a problem, but most of us stuck it out. 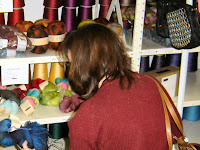 It was so much fun to be out in the fresh air, meeting fellow bloggers and Ravelers, admiring projects and yarns. Our organizer did a wonderful job getting the event together (I had hoped to link his blog, but it looks like he's not blogging anymore.) We were all shocked by the amount of swag he scored for our goody-bags. At the risk of sounding completely materialistic, the remainder of this post will be all about the loot! 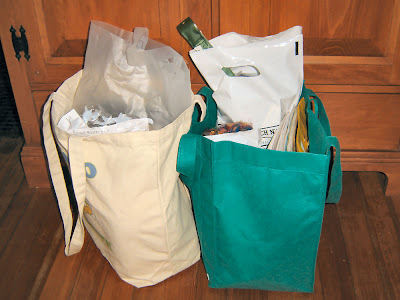 Here's a picture of the haul Pea and I brought home. So, what door-prizes did we win. Well, I have to say, I was completely stunned at the awesomeness of everything given away. The first one I opened (from Pea's ticket) made me squeal so loud a dozen muggles turned around to stare at me. What did I yell? "CASHMERE!!! I CAN'T BELIEVE I WON CASHMERE!!!!!" 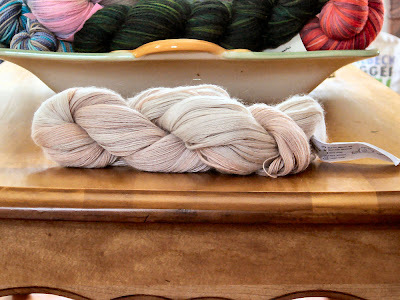 That is a gorgeous, sinfully soft skein of Artyarns Cashmere 5. 102 yards of 100% cashmere kindly donated by The Yarn Barn, along with an Artyarns pattern. I don't believe I ever in my life would have owned a skein of yarn as decadent as this, so I feel very lucky to have won it. But wait . . . . there's more. I still had my door-prize to open. You won't believe this . . . . but my prize was even better . . . .
What could be better than 100% cashmere? Hmmmm, what COULD be better than cashmere? Maybe . . . . .
Two skeins of . . . . . .
Can you read those labels? Here, let me help you out. Why no, it's not available for sale yet. Why yes, two skeins are on my coffee table, being fawned over with every spare moment I have. Just looking at it makes me feel dizzy and slightly faint. I have a feeling it's going to be on the needles mere moments after I hit the Publish button on this post. I almost slept with it under my pillow last night, but I was afraid I'd toss and turn a bit to much and get it all tangled up. We wouldn't want that!! Meltdown . . . .
as in THINGS THAT MAKE ME MELT-DOWN. What's making you melt-down these days? Or better yet, what saves you when you feel a melt-down coming??? The wait is over!!! 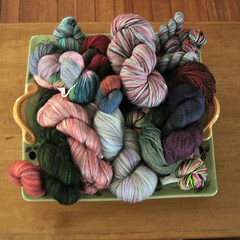 As promised, here is my post with all the sock yarn I bought at WEBS!!! Okay the first one technically isn't sock yarn. But it counts, because I'm going to knit socks with it. 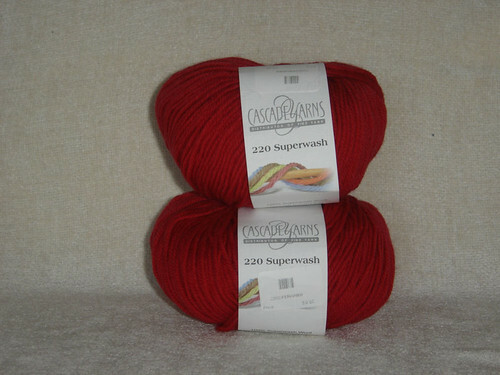 These two skeins of Cascade 220 Superwash are destined to become Log Cabin Socks from Handknit Holidays. Next up, I couldn't resist snatching up a couple of skeins of WEBS own sock yarn, Franklin, dyed by their very own Kangaroo Dyer. 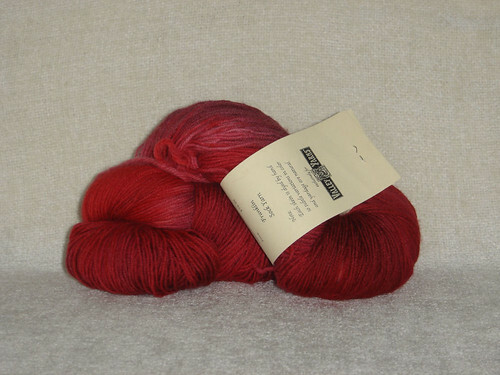 I guess I was on a red kick, because the first skein is Cherries. 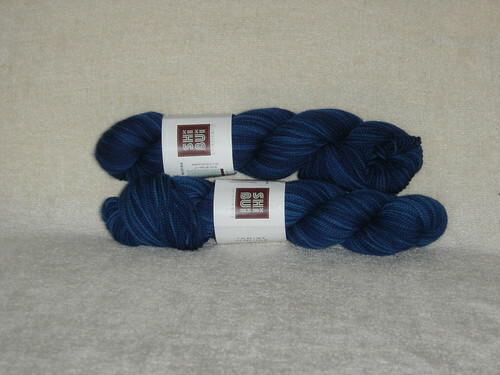 And the beautiful blue skein is Midnight. And lastly, the sock yarn I had set out to buy in the first place. Even before I knew all sock yarn was going to be 25% off that day. No matter what, I was coming home with some Shibui Sock. The first skeins of this . . . also named Midnight. Not much variation in my yarn choices that day, huh? But really, just look at it, how could you resist? 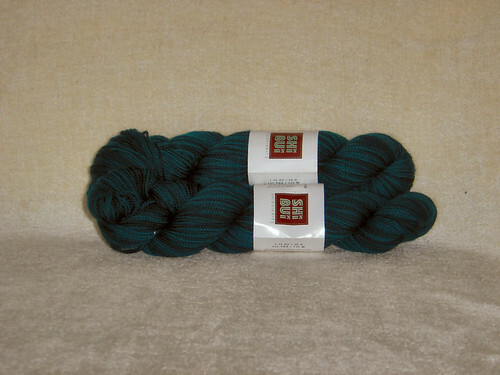 And the second skeins? Neither red nor blue!!! No, they beautiful jade greens called Peacock. Mmmmmm. And that concludes the Sock Yarn portion of my WEBS trip. 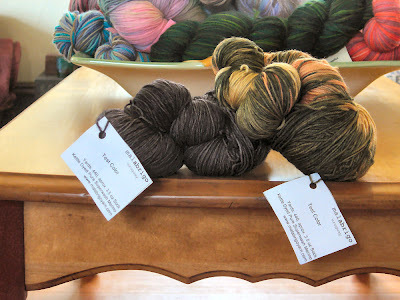 Next week, one more lone skein, in the Harlot Day - Luxury Yarn edition!! Contest alert . 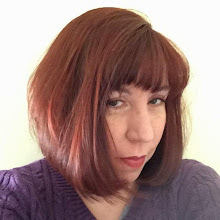 . .
Gingersnaps With Tea is holding her first contest, and it's a fun one. From now until June 15th, go on over and suggest your favorite non-sock pattern that can be knit with sock yarn. Let her know what your favorite colors are, and if you win she will try to tailor your prize to your color tastes. What could be better than that? So go on over and enter . . . and please let her know I sent you!! I was tagged a while ago by both Mandy & Nachaele for the latest meme that's going around. It's about time I answered it, huh? I'm not sure if the picture that I've put with this post is from 10 years ago or not, but it must be around that old. 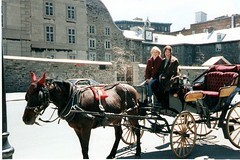 It's of my bestus buddy (since 6th grade) and me on a trip to Montreal. You can click to enlarge it and read a bit more about it. Let's see, I had just turned 30. I still lived with my parents, but was house-hunting. I was single - if I remember correctly, I wasn't even dating anyone. And I was working at my old job - I'm not sure if I still liked it or not, but I have a feeling I was already starting to hate it. I have to admit, I'm pre-writing this post, so I'll have to do some guessing here. But likely things are drink coffee, knit, read knitting blogs, listen to knitting pod-casts and tell Pea how much I love him. Potato chips, nuts, cheese and coffee. Yes, coffee is a snack to me! Hmmmm, open a yarn store, pay off our mortgage and buy a vacation home, get a new car, have Pea quit his job so we could travel, set my parents up here so they wouldn't have to move away somewhere with a lower cost of living (sob) and donate to find a cure for diabetes. My parent's house (CT), college (MA), my house (CT). BORING!!! Grocery store cashier, secretary at a lawyer's office, secretary for the college activities office, and Cable Advertising Traffic Supervisor. I may be the last one to get this meme done, so I probably already know all about you!! But if you haven't done it yet, please do! I love reading every one's answers.